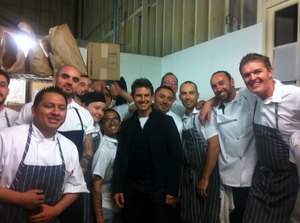 World’s most famous Scientologist and heartthrob ~Tom Cruise~ watched the America’s Cup on Sunday with his son Connor. They checked out the Emirates Team New Zealand Waka-base, and then headed to the SKYY Vodka Bar and Lounge, where Tom posed for lots of pictures with fans and was apparently all kinds of charming. Once the race was over, they hopped on the racing boat and sailed around Alcatraz. He also dined at the Waiheke Island Yacht Club on Saturday night. Word is, he was there with Warner Bros. executives discussing an upcoming film that will be shot in New Zealand. He sampled the Moa Pale Ales and the new tasting menu, which includes snapper ceviche, merino lamb, and coconut fromage for dessert. And check out that sweet picture with the kitchen staff!